WikiPedia has an excellent article on a sometimes overlooked source of high quality communications equipment and antennas. These communications systems are designed and built for the ultimate in survival – the United States military. 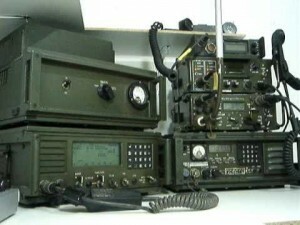 These military radios are readily available as surplus in various markets around the United States. The referenced article goes into some detail about the high costs of the military radios and yet these same radios can be found in military surplus stores for a mere fraction of the original costs. Can military radios be used in a survivalist’s communications plan? Absolutely! While they may be oversized and or over weight they are generally available at prices far below that of other commercial radios such as ham radios . Military radio gear has grown into quite a niche market which has enjoyed tremendous growth thanks to the Internet. Admittedly some of the gear is too large and/or too heavy to carry around in your communications bag. But the same gear might be attractive to those who have set up a base camp of sorts that there will evacuate to in times of stress and emergency. One aspect of military radio gear that a survivalist should not ignore are the surplus military antennas that are available. A very good bargain can usually be found in the form of portable antenna masts. These aluminium antenna masts, and sometimes fiberglas antenna masts, are generally available in a kit form consisting of several length of antenna masts (usually 4=foot sections). Along with the antenna mast there is a reinforced carry bag for the mast and any accessories need to erect the mast on site. By now you are asking yourself how a simple antenna mast could be if use in a survival environment. There are several scenarios here, each of them being used in different configurations. Attach a wire to the top of the mast, push or pull the mast into position, add ground and ground plane wires and you have a quite effect vertical antenna. Attach a small pulley to the top of the mast before erecting it and you can use it as a main support or outward support for any number of wire antennas. You can use these masts to support VHF and UHF vertical antennas and even small beams. Lower on the mast you could utilize a small pulley attached to the mast to hold wire antennas such as dipoles, NVIS verticals, slopers, inverted L, and many other wire based antennas.